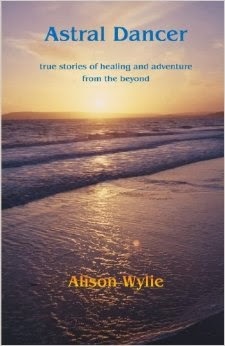 I've known Alison ("Ali") Wylie, author of Astral Dancer, for a few years now, thanks to facebook and other online sites. She's a fascinating woman and passionate about OBEs, but she keeps a very low profile. Like me, she is pretty quiet and reserved and doesn't do much to promote her book. In fact, I didn't even know the book existed, and I make it a point to: I've got one of the largest collections of OBE books on the planet. So when my wife Kathy and I (along with three other family members) took a vacation to Italy in late September, I had a golden opportunity to meet the author in person. As part of our trip, Kathy had planned to spend a day in the town of Caserta, and I knew Ali lives in a town not far from there. And so we met her at the main attraction in town, the Palace of Caserta. She (along with her husband and daughter) orchestrated an over-the-top picnic lunch for our meeting. I gave her a copy of my first book, Out of Body Experiences and she gave me a copy of her book, Astral Dancer. I only recently got a chance to read it. It's an interesting book, and unique in the genre. Due to unfortunate train schedules, mishaps and other circumstances, I didn't get to spend much time talking with her; about an hour: just enough to learn that she's a wonderful, warm person, with an inner strength that she doesn't let show. That shows in her book as well. Part One, "Danny's Story," is a strange set of interchanges and lessons involving Ali and Danny, who is kind of like another aspect of Ali. In my books, I wrote about my inner voice, and I suspect Ali is doing a similar thing with Danny, although with Danny there are more past-life and OBE connections. This is a journey of Danny's healing from past-life abuse, but it's about so much more: It's also about exploring different aspects of ourselves, karma, and awareness of our spiritual being and Higher Self, and spiritual growth, all facilitated by Ali and her OBEs. After Danny's story ends, it is "the Beginning of all the Others", also known as Part Two. This is mostly narratives of Ali's OBEs, and there's a lot of them. As I've done with all my OBE book reviews, I need to be honest and upfront about what I liked and what I didn't. The only thing I didn't like about the book was that the lines seemed to be sometimes blurred between OBEs and dreams. In my writing, I've always tried to make a clear distinction between ordinary dreams ("unconscious and hallucinating"), lucid dreams ("conscious and hallucinating"), and OBEs ("conscious but not hallucinating"). In this book, it wasn't always clear to me what was what. It seemed like there were transitions from OBEs into and out of dreams, and back again. I found that a bit off-putting, but that's probably just me and my own rigidity. After all, even in waking physical life, our minds form our perceptions, and that's all we ever really perceive, so I shouldn't get hung up on that, right? On the positive side, I love how Ali interprets her experiences; both dreams and OBEs. She clearly sees the spiritual lessons, and I admire that clarity of vision that most people lack. Her experiences--even negative ones--have a positive spin, and she explains them quite well. I love how Ali always confronts negativity with a level head, without fear, and on her own terms. There are times in the book where it seems like she'd like to sit down and have a nice cup of tea with the Devil (if such a being exists), just to chat and ask him a few questions and find out what makes him tick. Most ordinary human beings would be terrified of out their wits at the prospect of confronting the ultimate symbol of evil, but not Ali Wylie. Along the same lines, I love how she deals with negative energies and entities in her OBEs. She wraps them with love, joy and compassion, and in some cases, even directs them out a nearby window. Her gentle but mature nature shine brightly in this book. "We have to save our children, both in the literal sense and in the inner sense. We need to reconnect to our inner joy, to rediscover the wonder of life and of the world. Maybe if we all do this, humanity will find her inner child too." "There is always a choice, we can react from fear, from negativity and aggression or we can react from love, in peace." The author doesn't focus much on techniques or recommendations. Instead, she focuses on the OBE narratives and what we can learn from them at a spiritual level. This book is as much about life lessons (learning from our dreams and other experiences and connecting with different aspects of our soul) as it is about the actual OBEs. "I do a lot of dancing in the Astral. I often throw my clothes off and dance gracefully, like twirling energy, to hauntingly beautiful music, or I throw somersaults and dance enthusiastically in the air." So if you ever have an OBE and you see a naked woman darting about joyfully in the air, it might be Ali Wylie! But all kidding aside, I get it: too often I've cast aside all my own lessons, goals and missions to soar and dart about wildly in my OBEs. The freedom you feel is exquisite, and the joy is sometimes just too explosive to resist expression. In my reviews, I usually talk about the writing itself. The book has some endearing British colloquialisms that I need to acknowledge. It wasn't excessive, but at times I didn't even recognize a word, and had to look it up in the dictionary. For example, she writes: "I put a pair of dark plimsolls on and start running." Plimsolls are apparently running shoes. Still, that gave the book character and a unique personality. Being an admitted over-zealous grammar Nazi, I found some grammatical problems. Mostly these were just sentence fragments that should have, in my opinion, been broken into two sentences, as I pointed out above. However, that did not detract from the content; her meaning was clear. I don't recall any spelling errors, and only one typo. I give Astral Dancer a thumbs up, but I wouldn't recommend it as your first exposure to the topic of OBEs. Make it your fourth or fifth book instead. The reason is: there are some pretty wild stories in there, and it makes the topic seem a bit weird for newbies.